Enters 2019 as FSU’s active career leader with six interceptions. Appeared in all 12 games and started final 11 contests…recorded 58 tackles, including 1.0 for loss, team-high four interceptions, four pass breakups and one quarterback hurry…interceptions total ranked fourth in ACC and 16th in NCAA and was second-highest by a Seminole since 2008…three interceptions in conference play tied for second in ACC…made career-high nine tackles and grabbed one interception in 22-21 victory vs. No. 22 Boston College…named ACC Defensive Back of the Week for his performance vs. Eagles…opened season with two tackles vs. No. 20 Virginia Tech…made eight tackles, including 1.0 for loss, and one pass breakup in 36-26 win vs. Samford…had four tackles at Syracuse and two stops in 37-19 win vs. Northern Illinois…recorded five tackles and one interception in 28-24 victory at Louisville…interception at Cardinals sealed FSU’s victory with 36 seconds remaining…had three tackles at No. 17 Miami…registered eight tackles and one interception in 38-17 win vs. Wake Forest…had five tackles and one pass breakup vs. No. 2 Clemson…made four stops at North Carolina State…recorded five tackles, one interception, one pass breakup and one quarterback hurry at No. 3 Notre Dame…ended season with three tackles and one pass breakup vs. No. 13 Florida. An early enrollee who made an immediate impact, appearing in all 13 games and making his first career start against ULM…totaled 27 tackles, including 3.0 tackles for loss with 1.0 sack and two interceptions…cemented his place in the FSU-Miami rivalry, grabbing his first career interception vs. the 13th-ranked Hurricanes…made his second career interception in senior day win vs. Delaware State…recorded three tackles and his first collegiate sack in win at rival Florida…registered one forced fumble against Southern Miss in the Walk-On’s Independence Bowl. Consensus top five cornerback prospect in the nation and rated a five-star, No. 10 nationally and No. 2 cornerback by Scout…ranks No. 37 overall and No. 5 corner by 247Sports, No. 42 overall and No. 5 cornerback by Rivals, and No. 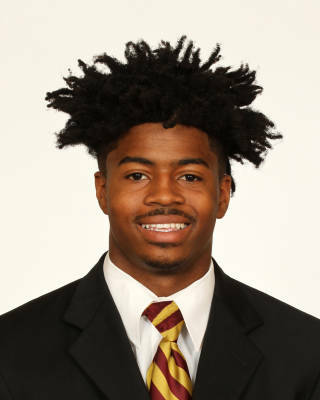 31 on the ESPN300…invited to the Under Armour All-America Game and ‘The Opening’…the 2016 All-Broward Defensive Player of the Year from the Sun-Sentinel…named to the 2016 All-USA Today Florida first team…a Seminole legacy, his father, Stanford Samuels Jr., played at FSU from 1999-2003 and coaches at Flanagan…led Flanagan to a state championship as a junior in 2015, sealing the victory with a pick-six…chose Florida State over offers from Alabama, Michigan, and Georgia, among others.